The Datamax-O-Neil MP Compact4 Mobile Mark II is designed for installation on forklift trucks and mobile stations. It can operate from a connection to a forklift's battery and its vibration-proof design makes it the perfect choice for warehousing logistics. 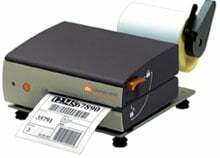 It features direct thermal printing at a choice of 203 or 300 dpi, a 5"/sec printing speed and a range of interfaces including RS-232 Serial, USB, Ethernet and 802.11b wireless. DPL versions also feature PL-Z, PL-I, and PL-B emulations. The Datamax-O'Neil XD1-00-07000000 is also known as ONE-MP200MOBILEDLP	or XD10007000000	.